We appreciate our involved parents and community members. We also enjoy broadcasting our latest news and information here on our News page where we will chronicle school activities and student achievements and publish announcements. We’ll also offer helpful resources and information. So check back often; we’ll update this page regularly. 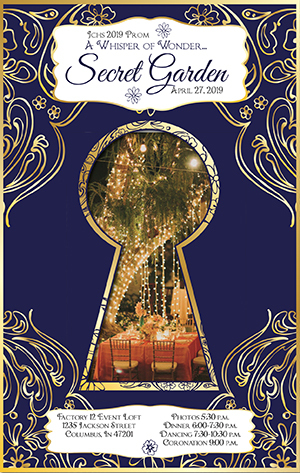 The Jennings County High School after prom carnival is on Saturday, April 27 from 11:30 p.m. to 1:30 a.m. Tickets will be available during student lunches in the cafeteria or the main office from Wednesday, April 17 through Friday, April 26. 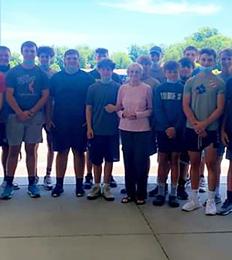 Tickets are free for any Jennings County High School junior or senior. All guests must be under 21. You do not have to go to the prom to go to the after prom, but you do need to have a ticket. Games will include karaoke, GA GA Pit, 9 Square, Lazer Tag, Melt Down, Human Fuse Ball, Plinko, Obstacle Course, Go Fishing, Baseball Toss, DJ Downs, and many more. Free food items such as pizza, hot dogs, cotton candy, barbecue, snow cones, and soda will also be available. 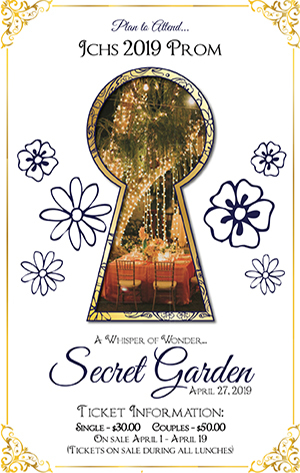 Please mark your calendar for the Jennings County High School 2019 A Whisper of Wonder…Secret Garden prom on April 27, 2019. Tickets will be on sale from April 1 through April 18 during all lunches. The cost is $30 for singles and $50 for couples. The prom will take place at Factory 12 Event Loft, 1235 Jackson Street in Columbus, Indiana. Photographer available beginning at 5:30 p.m.
Dinner from 6:00 until 7:30 p.m. Dancing from 7:30 until 10:30 p.m.
Coronation is at 9:00 p.m.
Pantry hours are 4:00 to 6:00 p.m., and if we cancel school, we will also close the pantry. The pantry is located in JCHS room 125B. Please drive to back parking lot, and enter through breezeway entrance “I”. Our school is bustling with exciting happenings. Check it out! Be sure to read our student shout-outs on our Student Spotlights page.